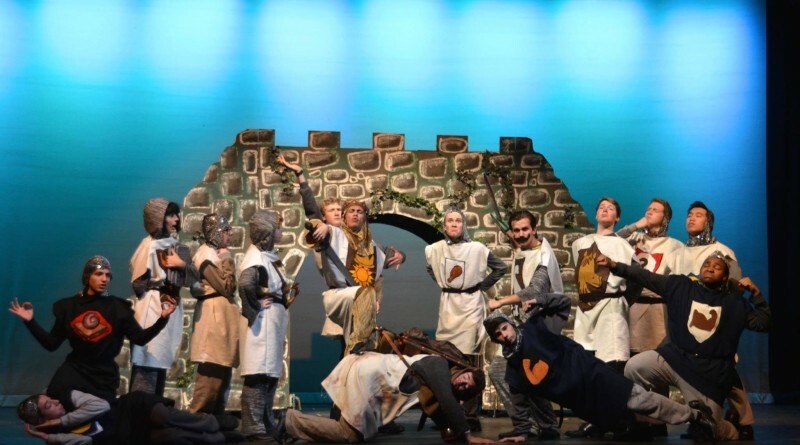 The Sharon High School Theatre Company’s rendition of Spamalot tumbled across stage for the first time this past Thursday in a whirlwind of random hilarities, vibrant and intricate costumes, and effervescent personalities. The musical comedy, which is the theater version of the renowned Monty Python and the Holy Grail, also performed on Friday, Saturday, and Sunday. “We had a cast that got quite close and everyone seemed to have each other’s back,” said Junior Komal Prakash, who played a ‘Laker Girl’ in the show. She added that it was a “lot to handle” to produce the show, yet her ability to depend on friends to work hard helped her avoid stress. Chinda Eleonu, a Sharon High School junior and member of the Theatre Company, says that he was happy when he heard Spamalot was to be the school’s fall musical. “We have a lot of naturally funny people in the Theatre Company. I think we do comedy really well here,” he said. “Anyone [in the show] that portrays a comedic role plays it really well,” added Eleonu. Junior Joseph Sears says he agrees, and that Spamalot’s light-hearted nature made preparation fun for those involved in the musical. “It’s how the actors feel. People have a better time with comedies during rehearsal,” he said. However, he adds that one of the drawbacks to a comedy was that actors sometimes got side-tracked when the mood turned too far from work. “Sometimes people had too much fun and didn’t take things seriously,” said Sears. Actors, set designers, costume designers, and members of the prop and stage crew faced puzzling dilemmas during preparation for the musical, but this helped them to learn how to think quickly and creatively in the face of pressing obstacles. “I think we made the plot colorful, though, and I think it will be fun to look at,” she said. Sophomore David Zhang was part of the stage crew for the first time this year, and he says that the experience was an enjoyable one. “This year wasn’t as hard as the other shows, because now we’re more prepared and organized,” he said. According to Sophomore Stephanie Fine, teamwork made Spamalot the success that it was. “This may sound cheesy, but it’s absolutely true…The day after shows everyone posts pictures on Facebook saying how much we already miss it,” she said. “Whether you are a cast, crew, design, or tech member, your role is crucial to the show,” said Fine.